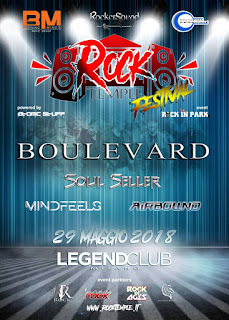 BOULEVARD FIRST OFFICIAL ITALIAN SHOW @ ROCK TEMPLE FESTIVAL! Rock Temple, the new international mail order dedicated to rock and metal music fans, in collaboration with Rocker Sound Agency & Burning Minds Music Group, is proud to announce the first official edition of its "Rock Temple Festival", an event that promises to become a brilliant annual kermesse for all the passionate supporters of this kind of music. This edition coincides with the first official Italian gig ever of one of the most beloved AOR bands... BOULEVARD! After two cult AOR releases in the late eighties, "BLVD" (1988) and "Into the Street" (1990), which gave them big exposure in their home country, Boulevard sadly dissolved in 1991, but finally reunited in 2014 starting to write new songs for their awaited studio come-back. The result is included in "Luminescence", an unquestionable masterpiece of up to date melodic rock music, which is getting outstanding feed backs from fans and critics, being already included in most of the "Top Album" lists of 2017. Opening acts of this special event are Soul Seller, a band that does not need any introduction to the international melodic rock fans, Mindfeels, the new Italian sensation of AOR / West coast music, and Airbound, ready to spread on stage the big potential captured in their self-titled debut album. The event will be part of the "Rock In Park" live saga, taking place on May 29, 2018 @ Legend Club, Viale Enrico Fermi 98, 20161 Milano (Italy). Info about tickets, stage timing, VIP packages and contests will follow soon!